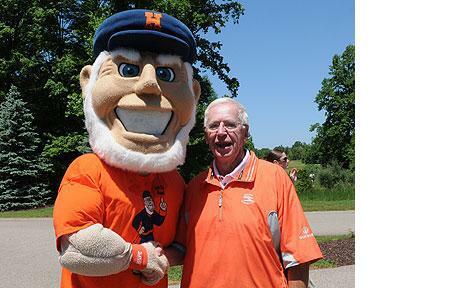 A 35-year tradition, the long-running event was renamed in 2000 for Bob DeYoung, who retired in June of that year as vice president for college advancement after working at Hope since 1965 in admissions, student development and advancement. DeYoung had been instrumental in establishing the outing. Registration for the morning begins at 7 a.m. and includes breakfast before the round and an Arnie’s Cottage Cook Out Lunch at noon, and is $85 per person. Registration for the afternoon begins at noon and includes the cookout lunch, and is $100 per person. The event is underwritten by PNC; Elzinga & Volkers; Buiten and Associates; Creative Dining Services; Fishbeck Thompson Carr and Huber; GDK Construction; GMB Architecture + Engineering; Hilliard Lyons; Kerkstra Pre-Cast; Lakewood Construction; Lighthouse Group; and Watkins Ross. The net proceeds from the sponsorships and entry fees will be applied to the Robert ’56 and Marcia ’55 DeYoung Scholarship Fund at Hope for students pursuing teacher-education studies.